Nazli Choucri is Professor of Political Science, and serves as Associate Director of MIT’s Technology and Development Program (TDP). She is the architect and Director of the Global System for Sustainable Development (GSSD), a multi-lingual web-based knowledge networking system focusing on the complexity of sustainability. Elected to the European Academy of Sciences, Dr. Choucri continues to engage in research and/or consult for national and international agencies, and to engage in empirical and policy analysis in numerous countries. The author of ten books and over 120 articles, she is the Principal Investigator and Director of the MIT-Harvard multi-disciplinary research project on Explorations in Cyber International Relations (ECIR). Given its ubiquitous nature and vast scale and scope, cyberspace—including the Internet and the hundreds of millions of computers the Internet connects, the institutions that enable it, and the experiences it enables—has created a new reality for almost everyone and everywhere. 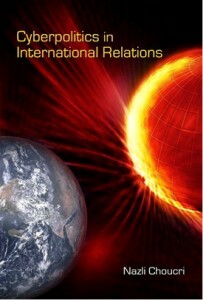 Many features of cyberspace challenge contemporary international relations theory, policy, and practice. Those related to time, space, permeation, fluidity, participation, attribution, accountability, and ubiquity are among the most serious. And, it has led to the creation of a new venue for politics, namely cyberpolitics. Cyberpolitics, a recently coined term, refers to the conjunction of two processes or realities—those pertaining to traditional human contentions for power and influence (politics) surrounding the determination of who gets what, when, and how, and those enabled by a constructed domain (cyber) as a new arena of human interaction with its own modalities, realities, and contentions. This book explores the many facets of this emergent cyberpolitics in international relations, and highlights potential alternative futures. How can we take explicit account of cyberspace in the analysis of world politics? How can we integrate the traditional international system with its cyber venues? How do we address new imperatives for international relations theory created by emerging issues in cyberspace? Grounded in theory, methods include selective process tracing, targeted empirical inquiry, and review of observed effects at the individual, state and non-state international, transnational, and global levels. • New challenges to national security, from sources of vulnerability without precedent (cyber threats), new dimensions of national security (cyber security) coupled with uncertainty, fear, and threat from unknown sources (attribution problem). • Novel types of asymmetries that shift traditional power relations and create new opportunities for weaker actors to threaten stronger ones, for various uses of cyber-anonymity, for new cyber venues of political, industrial or military activity, and for expansion of criminal activities – and others. • Diverse forms of cyber conflicts and contentions that challenges stability and security of the state system, such as the militarization of cyberspace, the conduct of cyber warfare, threats to critical infrastructures, undetected cyber espionage and so on. • Empowerment of new actors – some with clear identities and others without – but all often too varied to track and too anonymous to identify– over and above the emergence of new and unregulated markets. • Unprecedented and unexpected power of institutions for cyber management, largely private entities created specifically to enable and manage cyber interactions (such as ICANN and IETF), or to help support cyber security (such as CERTS). • Significant push back by traditional international institutions (such as the International Telecommunications Union) that question the legitimacy of the new institutions for management of cyberspace. • New demand for cyber cooperation to contain the growth of cyber conflicts reinforced by a growing push for framing global cyber norms. • Increased density of decision makers for cyber domain with unclear mandates that obscure responsibility, question legitimacy, and enhance uncertainty. • New coupling of politics in the traditional and cyber domains shape new strategies based for cross-domain leverage and bargaining that are seldom consistent with conventional practice (such as the Stuxnet event and its ongoing aftermath). • Transformative effects of cyber access that permeate all levels of international relations. It is an example of my own multidisciplinary orientation – addressed earlier on matters of war and peace, and later on environmental issues and challenges of sustainability. (c) Explore the co-evolution of cyberspace and international relations.